The term manual therapy refers to a hands-on treatment of muscles, tendons, ligaments, and joints as opposed to using a device or machine. 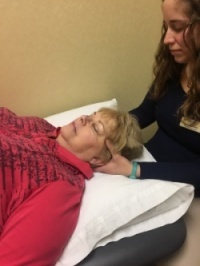 In manual therapy, therapists use their hands to put pressure on muscle tissue and manipulate joints in an attempt to decrease pain caused by muscle spasm, muscle tension, and joint dysfunction. Manual therapy techniques aim to increase function as well.